Today marks Avril-L.org's 7 year anniversary! WOW I can't believe how fast time as flown! Thanks for being a fan of the site and of Avril, and I can't wait to see what the future brings! Have you purchased your AD Loves Japan tshirt yet? 100% of all net profits go to the The Avril Lavigne Foundation to support Mercy Corps’ “Comfort for Kids” program in Japan to provide post-trauma assistance to children following the Japan earthquake and pacific tsunami. It's a great cause! Remember last week when I pposted about Abbey Dawn being showcased at the Bread & Butter Brand Supershow in Berlin, Germany July 6-8? AbbeyDawn.com has posted (with a beautiful new photo) more info regarding this, and it looks like Avril herself will be attending, and showing off the newest additions to the line such as shoes, swimwear and handbags. Abbey Dawn will also be made available in Hot Topic stores as of July. 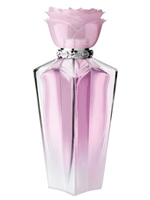 The bottle is pretty much the same as Forbidden Rose with a Black Star coloring. Not exactly imaginative, but hopefully it smells as great as the first 2! Avril Lavigne will launch her ​​third fragrance called Wild Rose. The fragrance is a fruity and floral scent that described as feminine and blend of sun- kissed fruit and a beautiful flower, will be available from August 2011. Previously, Avril Lavigne has launched her first fragrance in 2009 called Black Star and her second fragrance Forbidden Rose in 2010. As we know that Wild Rose fragrance was developed from her earlier fragrance. The fragrance is made from the composition of fruits with notes of mandarin, red grapefruit and plum. It’s has a heart with accents of the frangipani flower, blue orchid and orange blossom, while the base notes are musk, sandalwood and creme brulee. It's another day (and another HOT bikini) of Avril and friends on a private yacht in St. Tropez, France. This time, Avril is seen chilling on the boat and in the water with her Hello Kitty boogie board and ex-husband Deryck Whibley! Thanks Avrilsmusic. Avril will be appearing at the 2011 Teen Choice Awards in August! Here's to hoping for a performance of "Smile" or the third single! Is Abbey Dawn coming to Europe? It seems like AD will be featured in the Bread & Butter Brand Supershow in Berlin, Germany July 6-8. I don't think Avril will be physically attending the show, but it's an exciting step for Avril. It's day 2 of Avril's St. Tropez vacation and much like yesterday, she was spotted today relaxing on a private yacht with her girlfriends. Thanks Avrilsmusic. After she left Toronto, Avril jetted off with 3 girlfriends to St. Tropez, in the south of France. Remember how Avril has said that she likes to plan random vacations with her friends to St. Tropez? Haha. Looks like she was having a great time drinking, smoking, dancing, taking pictures, giving a friend a lap dance, and jumping off of the boat. Thanks Avrilsmusic. A new, second show at the Hammersmith Apollo in London, UK on September 22 has been added. While in Toronto over the weekend for the 2011 MuchMusic Video Awards, Avril had a Skype chat with a contest winner and told her “I would like to release the 5th album really quick. This record [Goobye Lullaby] was more mellow, and the next one will be pop and more fun again. I already have a song that I know is going to be a single, I just need to re-record it!” She also said that she "already has 8 songs". If you recall, there were a few songs (Fine, Gone, and one with Alex Da Kid, for example) that Avril recorded for Goodbye Lullaby that didn't make the cut, so let's cross our fingers for a new album in 2012!